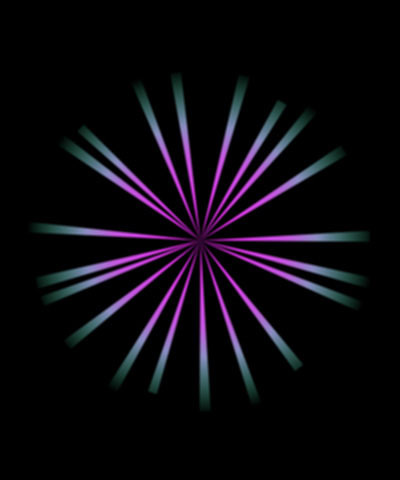 The BCC Rays generator creates a ray burst effect. The rays can act as a ﬁlter on a clip or layer or generate a ray layer. The Rays effect is comprised of two discrete elements, the rays and the glow. The ﬁlter provides controls for adjusting each element individually. The rays can be composited over the source image, or you can generate a completely synthetic image. Ray Center sets the center of the simulated light source which creates the rays. The glow section of the rays is always centered around the Center. Off ignores the ﬁltered layer and only render the rays. Replace Alpha only uses the alpha channel of the rays. The rays’ alpha channel is composited with the original alpha channel using the Replace apply mode. Screen Alpha only uses the alpha channel of the rays; color values are taken from the ﬁltered layer. The rays’ alpha channel is composited with the ﬁltered layer using the Screen apply mode. Multiply Alpha only uses the alpha channel of the rays; color values are taken from the ﬁltered layer. The rays’ alpha channel is composited with the ﬁltered layer using the Multiply apply mode. Diff Alpha only uses the alpha channel of the rays; color values are taken from the ﬁltered layer. The rays’ alpha channel is composited with the ﬁltered layer using the Difference apply mode. The Final Apply Mode menu determines how the rays are composited when the Composite on Original menu is set to After Render. The menu choices correspond to apply modes. For descriptions of all the possible Apply Modes, Click Here. 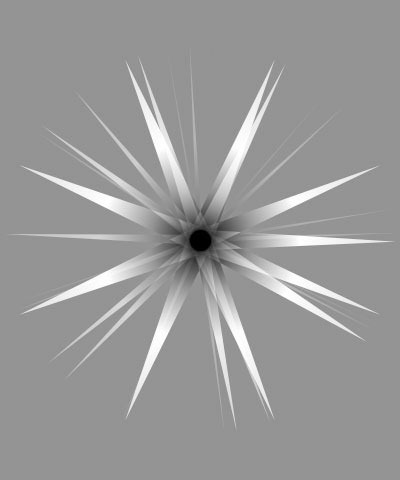 Aspect adjusts the shape of the ray burst. Positive values stretch the rays horizontally, and negative values stretch them vertically. Count determines the number of rays in the effect. Length sets the length of the rays. Intensity adjusts the intensity of the rays. Thickness sets the width of the rays. Higher values produce wider rays. When the Scale Thickness to Count checkbox is selected, the ray Thickness value is scaled by the ray Count setting. This causes the rays to become thinner as Count increases. The Shape menu sets the shape of the rays. The choices are Taper, Pinched Taper, Bidirectional Taper, Line, Rounded Line, Crossed Line, Wedge and Fill. The following examples illustrate of some of the shape settings. Pinch Distance affects the shape of the pinched edges when the Shape menu is set to Pinched Taper. Each ray has a trapezoidal shape, so increasing this parameter moves the two corner of the trapezoid away from the center. Negative values bunch the rays around the center point and they taper as they move away from the center point. When the Shape menu is not set to Pinched Taper, this parameter has no affect. 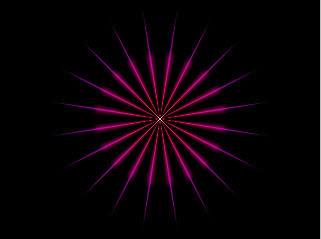 Rotation spins the rays around the point from which they emanate. Angular Width determines the width of the angle in which the rays appear. At the default setting of 360, the rays emanate in a full circle. A setting of 180 produces rays in a semicircle, and so on. Increasing Bunching distributes the rays within the Angular Width area less evenly, placing more rays closer to the speciﬁed Rotation angle. Negative values place some rays outside the speciﬁed Angular Width. 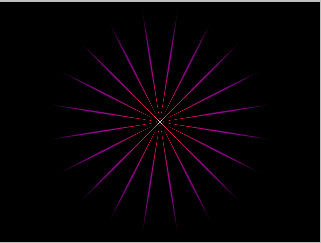 Positive Center Overlap values cause the rays to extend through the center to the other side. 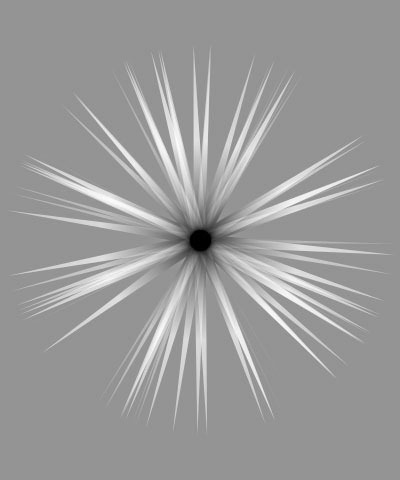 Negative values cause the rays to fade before reaching the center. The Gradient Type menu determines the type of color gradient that is applied to the rays. 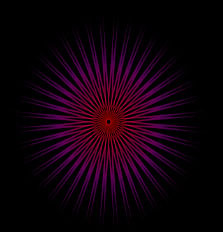 A Radial gradient places the Inside Color at the center and blends outward toward the Outside color. A Contour gradient places the Outside Color along the four edges of a rectangular frame and blends inward toward the Inside Color in the center of the frame. A Hollow Contour gradient produces the reverse of a Contour gradient. The Inside Color appears at the four edges of a rectangular frame and blends inward toward the center of the frame which is transparent. 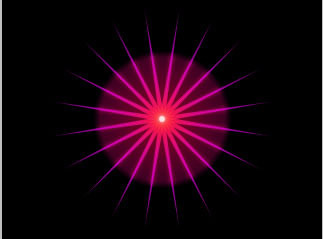 A Center gradient causes the gradient for each ray to more closely follow the shape of the ray. A Hollow Center gradient has the same relationship to center as Hollow Contour has to Contour. 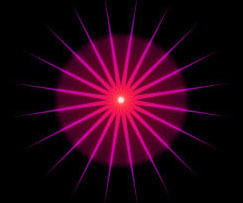 Each ray is composed of a gradient which moves from the Inside Color closest to the center of the ray pattern, to the Outside Color, and then to transparency at the tip of the ray. 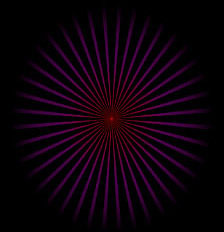 If you imagine the rays forming a ﬁlled circle around the center point, the colors form a radial gradient with the Inside Color in the center, transparency at the edge, and the Outside color in between. When the Normalize Colors checkbox is selected, all of the colors in the effect are set to their maximum brightness, which correspondingly reduces Intensity. 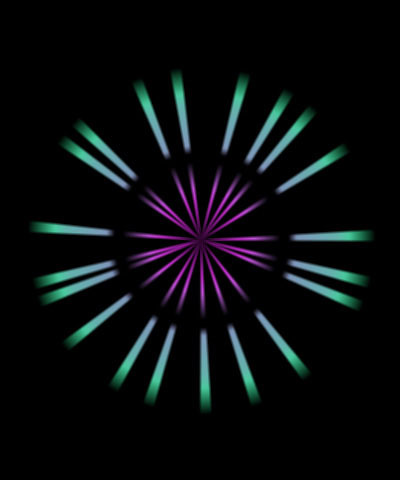 Normalize Colors generally produces more realistic effects. 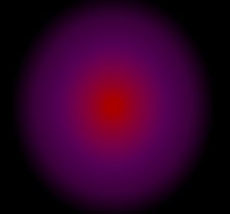 Center Width adjusts the radius of the region colored by the Inside Color parameter. Outside Fade adjusts the appearance of the gradient by moving the color stops along the gradient, which changes the width of each color in the gradient. Gradient Radius Scale scales the color gradient that is applied to the rays. As the value increases, more of the inside color is visible. Contour Softness softens the transition between the Inside Color and the Outside Color when Gradient Type is set to Contour or Hollow Contour. This parameter has no affect on the other gradient types. The Ray Splits controls only have an affect if the Ray Splits On checkbox is selected and the Gradient Type menu is set to Radial. These parameters have no affect on the other gradient types. When the Ray Splits On checkbox is selected each ray splits into line segments. When this option is not selected, the other Ray Splits parameters have no affect. Ray Splits sets the number of splits in the line segments. For example, when Ray Splits is 1, each ray consists of two line segments (one split) separated by a transparent region. The total length of the rays does not change, so higher Ray Splits values create shorter segments within each ray. Split Width adjusts the width of the regions between segments by setting the ratio of the length of the transparent region between the segments in a ray to the length of the ﬁrst segment. Higher values create larger transparent regions and, therefore, shorter segments. If Splits is 0, this parameter has no affect. Split Softness softens the ends of the segments. Higher values produce softer ends. If Splits is 0, this parameter has no affect. The Split Gradient Type menu determines how the color gradient is applied to the split rays. If Ray Splits is 0, this parameter has no affect. Faded applies a single gradient that fades from Inside Color to the Outside Color to transparency over the length of each split ray. 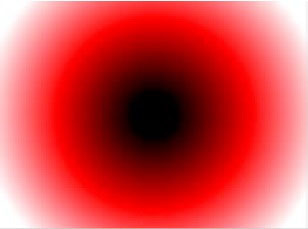 Note that if Ray Splits is not a whole number, the rays may end in the opaque part of the gradient, causing their ends to transition suddenly from opacity to transparency. 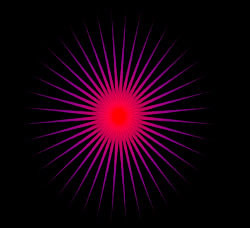 Loop applies the gradient separately to each segment of the split rays. 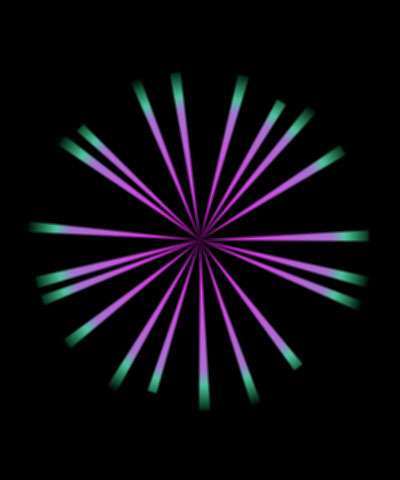 Loop Back & Forth is similar to Loop, but it reverses the color order in alternate segments. Loop BF Opaque is similar to Loop Back & Forth, but it reverses the color order in alternate segments. without any transparency. When the Scale to Ray Length checkbox is selected, and the ray’s Lengths vary due to a setting in the Variance parameter group, the ray Splits value is scaled by the ray Length setting. This causes the rays to have more Splits as Length increases. The Ray on Ray Apply Mode menu determines how rays are composited on each other when they overlap. 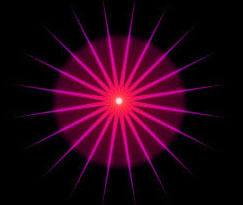 For example, all rays overlap at the center point. The menu choices correspond to apply modes. For descriptions of all the possible Apply Modes, Click Here. 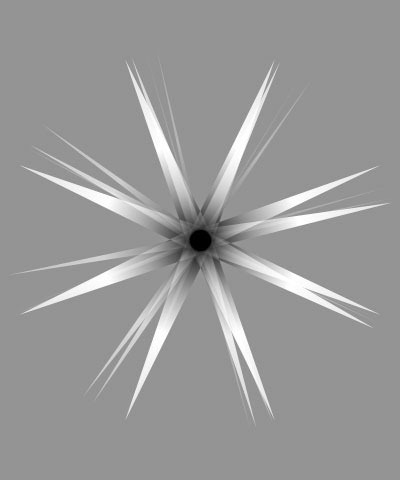 The Angular Splits parameters can be used to split each ray into multiple rays. When the Angular Splits On checkbox is selected, the controls in the Angular Splits parameter group split each ray into multiple rays, using a random number generator to control the pattern. When this checkbox is deselected, the Angular Splits parameters have no affect. 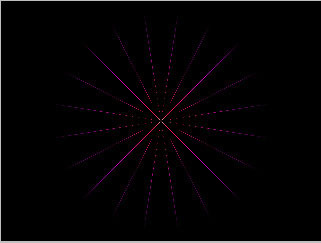 Angular Splits adjusts the number of splits created from each ray. Split Width sets the angular distance between the split rays and the original rays. Split Fade Time controls how fast new rays reach their maximum intensity as the Angular Splits value increases. Lower Split Fade Time values cause new rays to reach their maximum intensities more quickly. The Split Narrows Rays menu determines how the Angular Splits value affects the thickness of the rays. Off leaves the thickness of the rays and angular splits unchanged regardless of the Angular Splits value. Low causes the rays and angular splits to become narrower as the Angular Splits value increases. High works similarly to Low, but the Angular Splits value has an even more pronounced affect on the widths of the rays and splits. The Split Variance Type menu controls the type of number series used to position the angular splits. Noise uses a random number sequence. When Ray Variance Type is set to Noise, the Split Seed/Multiplier/Frequency value is used as the input value by the random number generator. Fractal uses a sequence derived from fractal math. When Fractal is chosen, low Split Seed/Multiplier/Frequency and Split Start/Phase values produce a regular series, and high values produce a more chaotic series. Constant offsets all the angular splits’ positions uniformly by the chosen Variance Amount. The remaining choices correspond to waveforms. When a waveform options is chosen, Split Seed/Multiplier/Frequency sets the frequency of the wave, and Split Start/Phase sets the starting phase. Seed: Determines the amount of angular splits that are generated in the pattern. This parameter changes depending on which Split Variance Type you select. Split Start/Phrase: Controls the rate at which the changing pattern of angular splits progress. The Glow parameters control the glow portion of the rays. If the Glow On checkbox is deselected, the controls in the Glow parameter group have no affect. When the Glow On checkbox is selected, the controls in the Glow parameter group add a glow to the rays. When this checkbox is deselected, the Glow parameters have no affect. Glow Radius controls the size of the glow radius. Higher values produces a larger glow. Adjust Glow Intensity to scale the intensity of the glow. At higher values, the glow is more opaque. Glow Falloff controls the relative softness of the edges of the glow. Leave Glow Falloff at its default setting of 10 if you prefer a soft edge, or decrease this value to harden the edges of the glow. When the Use Ray Colors for Glow checkbox is selected, the glow uses the colors of the underlying gradient. When this checkbox is deselected, the glow uses the speciﬁed Glow Inside Color and Glow Outside Color. The glow is composed of a gradient which blends from the Glow Inside Color to the Glow Outside Color, and then to transparency. 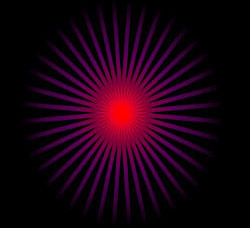 If you imagine the glow forming a ﬁlled circle around the center point, the colors form a radial gradient with the Glow Inside Color in the center, transparency at the edge, and the Glow Outside Color in between. If the Use Ray Colors for Glow checkbox is selected, these parameters have no affect. The Focus Matte parameters allow you to narrow the rays or the glow. These parameters create a matte that is centered around the rays positions. Select the Focus Matte On checkbox to turn on the focus matte (see the next section). If this option is not selected, the Focus Matte parameters have no affect. Ray Focus determines how much the rays are focused or narrowed. Higher values produce narrower rays. At a value of 0 is equivalent to deselecting the Focus Matte On checkbox. If the Use Ray Focus for Glow checkbox is selected, the Ray Focus value is used to set the Glow Focus. If this checkbox is deselected, the Glow Focus value sets the Glow Focus. Glow Focus determines how much the glow is focused or narrowed. Higher values produce narrower rays. If the Use Ray Focus for Glow checkbox is selected, this parameter has no affect. 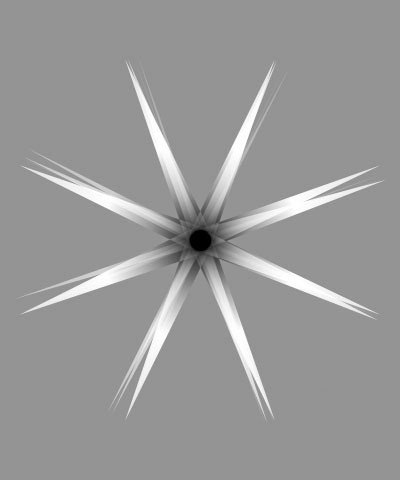 If the Uniform Angular Focus checkbox is selected, the rays focus uniformly from the center to the edges of the ray burst. 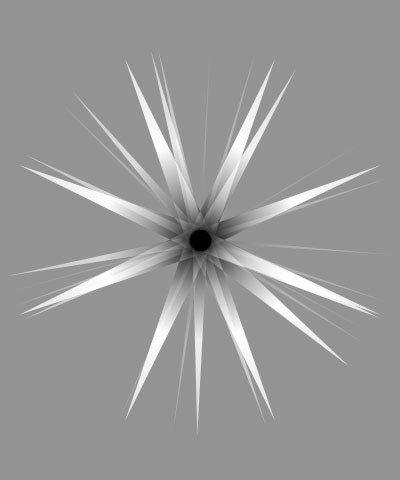 If this option is not selected, you can create regions at the center of the ray burst and at the edges in which the rays are less focused. When Uniform Angular Focus is not selected, Focus Radius sets the radius of the circle in the center of the ray burst in which the rays are less focused. Higher values produce a larger unfocused region. Focus Inside Falloff softens the transition between the unfocused area at the center of the ray burst and the focused rays. Higher values produce a more gradual transition. This parameter has no affect if Uniform Angular Focus is selected. Focus Radius: Determines where the position of the radius. As the rays extend outward beyond the Radius, they fade as their transparency increases. Focus Outside Falloff adjusts the length of the rays beyond the Radius before they become transparent. Higher values produce longer rays. This parameter has no affect if Uniform Angular Focus is selected. Select the Render Matte Only checkbox to render the Focus Matte as a black and white matte. 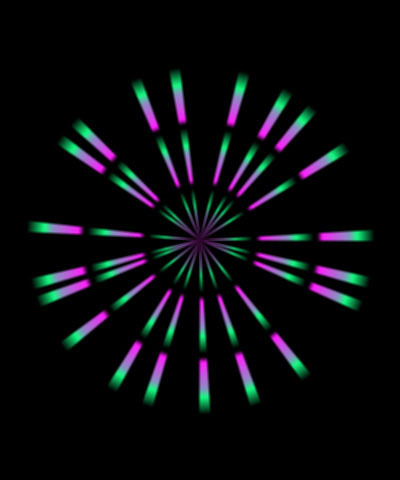 This is useful to view the affect of the focus matte. The two Variance parameter groups can vary almost any attribute of the ray effect. Each Variance group varies up to three attributes of the rays using a sequence of random or ordered numbers. Each Variance group uses the same controls, which are described below. Select the Variance 1 and Variance 2 On checkboxes to turn on the variances below. Deselect these option to turn off the variances. If these checkboxes are not selected, the parameters in the Variance 1 and Variance 2 parameter groups have no affect. The Variance Type menu controls the number series used to vary the selected attributes. 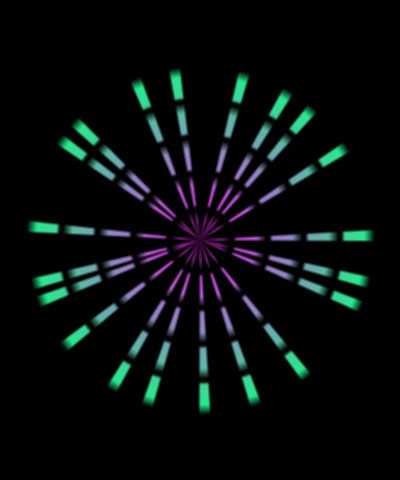 Noise uses a random number sequence. When Ray Variance Type is set to Noise, the Seed/Multiplier/Frequency value is the input value used by the random number generator. 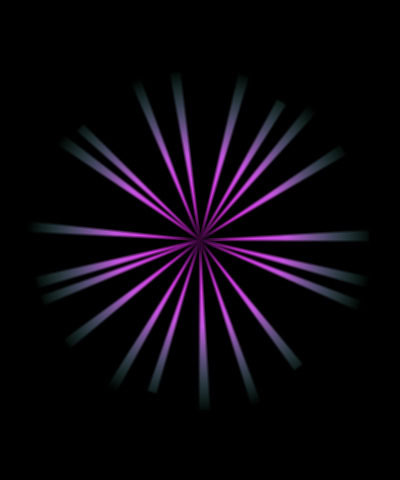 Fractal uses a sequence derived from fractal math. When Fractal is chosen, low Seed/Multiplier/Frequency and Start/Phase values produce a regular series, and high values produce a more chaotic series. Constant varies the attributes uniformly by the speciﬁed Variance Amount. The remaining choices correspond to waveforms. When a waveform is chosen, Seed/Multiplier/Frequency sets the frequency of the wave, and Start/Phase sets the starting phase. Variance Destination 1, Variance Destination 2, and Variance Destination 3 allow you to choose up to three different parameters to affect by the variance. Off turns off the Variance Destination, so it affects no parameter. Length varies the Length of the rays. The Length parameter is set in the Rays parameter group. Thickness varies the thickness of the rays. The Thickness parameter is set in the Rays parameter group. Angle varies the angular position of the rays, leaving them unevenly spaced. Intensity varies the Intensity both the Inside and Outside Color of the rays. The Intensity parameter is set in the Rays parameter group. Inside Intensity and Outside Intensity vary the intensity the Inside and Outside Color of the rays, respectively. Hues, Inside Hue and Outside Hue vary the hues of both the Inside and Outside Color, only the Inside Color or only the Outside Color of the rays, respectively. The Intensity parameter is set in the Rays parameter group. Saturation varies the saturation of both the Inside and Outside Color of the rays. Color HLS varies the Hue, Lightness and Saturation of both the Inside and Outside Color of the rays. Gradient Center varies the parameter controlled globally for all of the rays by the Center Width control. Focus Intensity varies the opacity of the Focus Matte making some rays fade away and others become more opaque for most of their thickness. Focus is a matte that sits over the ray and focuses it, causing some rays to appear narrow and more focused and others to appear wider and less focused. Focus Width varies the Width of the Focus Matte from ray to ray, making some rays narrower and others thicker. Each Variance Destination has an Amount and a Skip control which appear when the destination is set to any choice other than Off. Variance Amount determines the amount of variation applied to the chosen destination. Variance Skip sets the number of elements in the sequence that are skipped before the numbers are used. Note: If Variance Type is Noise, you can use Skip to produce a completely different set of random numbers for each Variance Destination. If Variance Type is set to Fractal or one of the wave options, Skip allows you to manipulate the relationship of the patterns produced by each of the Variance Destinations. The Interaction parameters allow you to simulate the effect of the rays subsiding as the light source disappears behind an object in the scene. Select the Interaction On checkbox to turn on the Interaction parameters described below. If this checkbox is not selected, the parameters the Interaction parameters have no affect. The Obscuration Type menu determines how the obscuration is applied. When Off is selected, no obscuration occurs. The Alpha, Inverse Alpha, Luma, and Inverse Luma options scale the rays’ Intensity by the corresponding color channel values from the Obscuration Source Layer. Replace RGB replaces the RGB color values of the rays with the Obscuration color set by the Obscuration Layer image. Color Multiply, Color Screen and Color Difference apply the resampled pixel around the obscuration point to all colors used in the effect, using one of the apply modes. Color and Hue replaces the Color and Hue values of the rays, respectively, with the Obscuration color set by the Obscuration Layer image. The Obscuration Layer menu chooses any clip or layer in the composition to obscure the rays. The obscuration color is the average color within the obscuration radius of the Center. Note: If necessary, the Obscuration Layer is resized to conform to the size of the ﬁltered layer. Obscuration Radius controls the size of the region in the Obscuration Layer which is used for obscuration. This value is scaled as a percentage of the height of the ﬁltered image. Increasing this value decreases the rate of change as the light source moves across the obscuration image, or as the obscuration image changes over time. 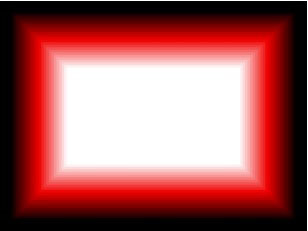 Obscuration Amount adjusts the amount of the effect obscured in each affected pixel. Higher values increase the obscuration. The Location parameters allow you to use information from another clip or layer to control the position of the rays. The Location Type menu determines which channel in the Location Layer image is used to adjust the position. The choices are Alpha or Luma. If Off is selected, the Location parameters have no affect. The Location Layer menu chooses any clip or layer in the composition to adjust the position of the rays. To adjust the rays’ position, the ﬁlter computes the “center of light” in the chosen Location Type channel in the Location Layer image. 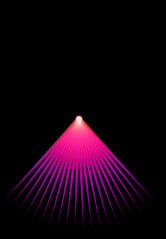 Location Inﬂuence animates the rays along a line from the Ray Center point to the computed center of light. 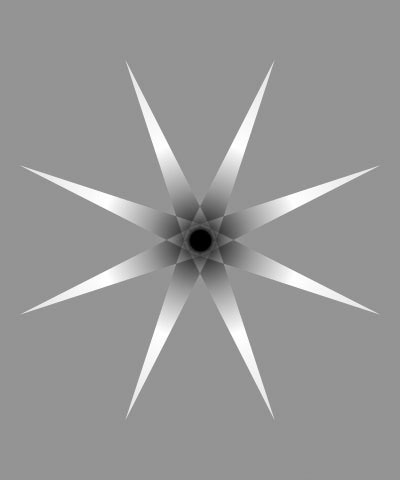 If Location Inﬂuence is 100, the Ray Center is ignored and the rays are centered at the center of light. 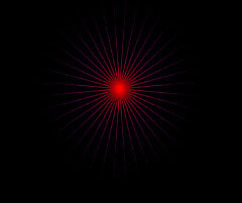 If Location Inﬂuence is 50, the ray center is midway between the center of light and the Ray Center point, and so on. Blur applies a blur to the ﬁnal output. Increase this value to add more blur. Blur Quality adjusts the quality of the Blur. Pyramid is the fastest option and is generally adequate. It produces a blur similar in quality to the BCC Pyramid Blur ﬁlter. Pyramid Smoother produces a blur that is smoother than Pyramid. The remaining choices, Gaussian Low, Gaussian Medium, Gaussian High, Gaussian Higher and Gaussian Highest produce gaussian blurs of increasing quality. These options increase rendering times proportionately.